Our finished card border art! 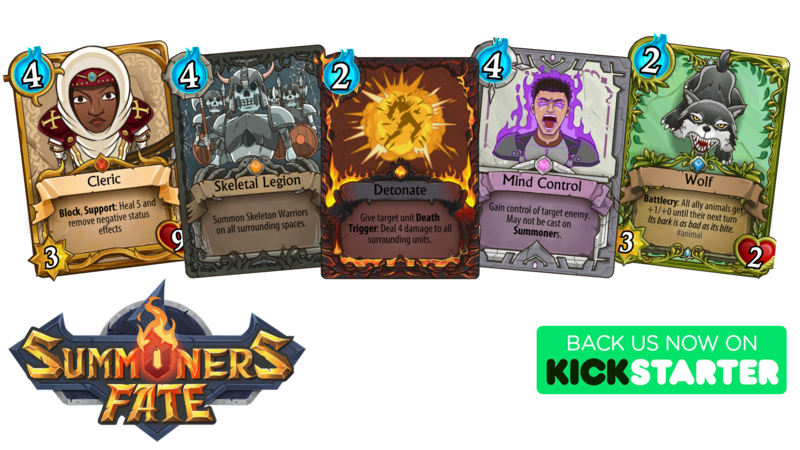 Here are 5 of our 6 card types. From left to right, they are Celestial, Void, Chaos, Arcane, and Nature. The one that is missing is Earthen, which is our Neutral card type. I will detail these further in a future post. I'm so happy to announce we've been FUNDED in 13 days on Kickstarter! THANK YOU supporters! Ross and I are pumped! 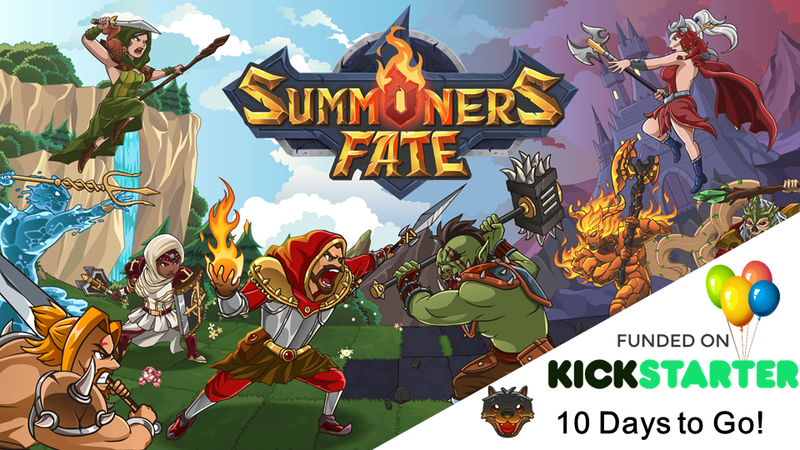 We have 10 days left in our Kickstarter, and are now looking toward our fun Stretch Goals. First one is adding a race of Celestial TimeKeeper Steampunk Ratmen race - so strange, it just has to work If you're a fan of Steampunk, time manipulation spells, "good" characters, and/or Rats, this is the Race you've been missing. 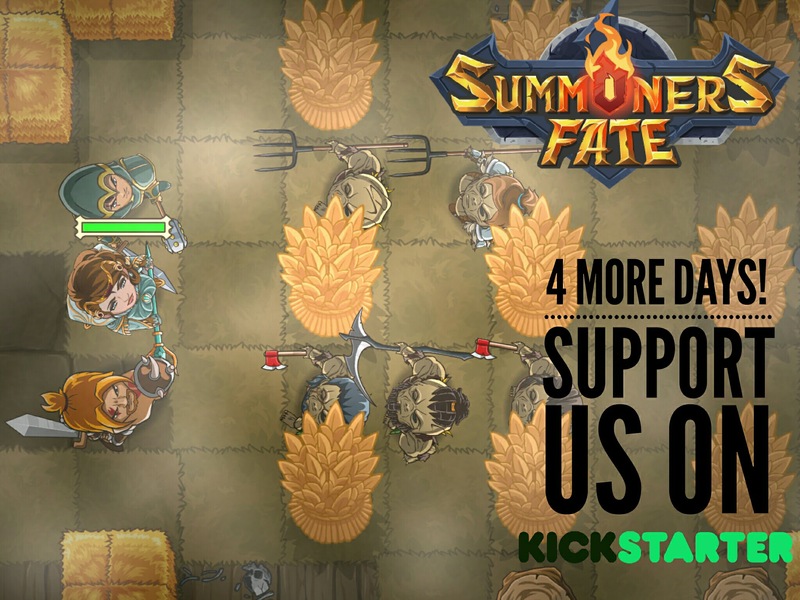 Click on the picture above to view our Kickstarter, and watch our trailer! 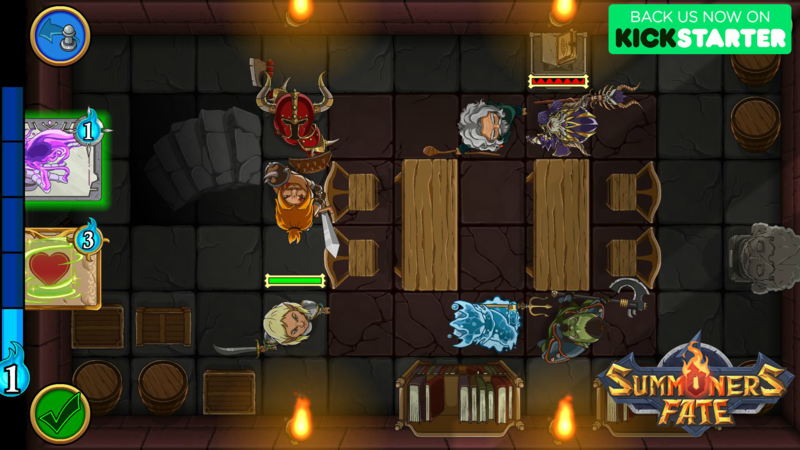 Can you guess which board game inspired this dungeon? 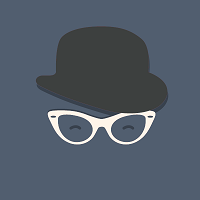 Oh, and Ross says "Keep answer a secret if you took part in the Discord chat about this, but feel free to offer misleading clues"
Podcast - iTunes Click Here. 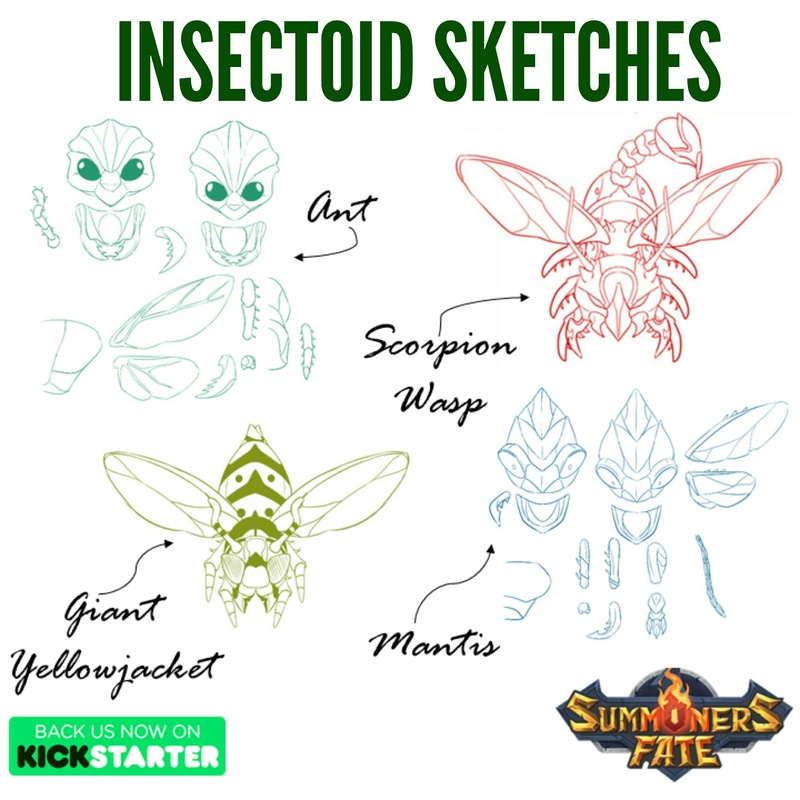 As you can see, we have sketches of an Ant, Scorpion Wasp, Giant Yellowjacket, and a Mantis. These will be human sized, which is why were are referring to them as Insectoids vs. insects. Most of these will have flight ability, among other really fun powers. 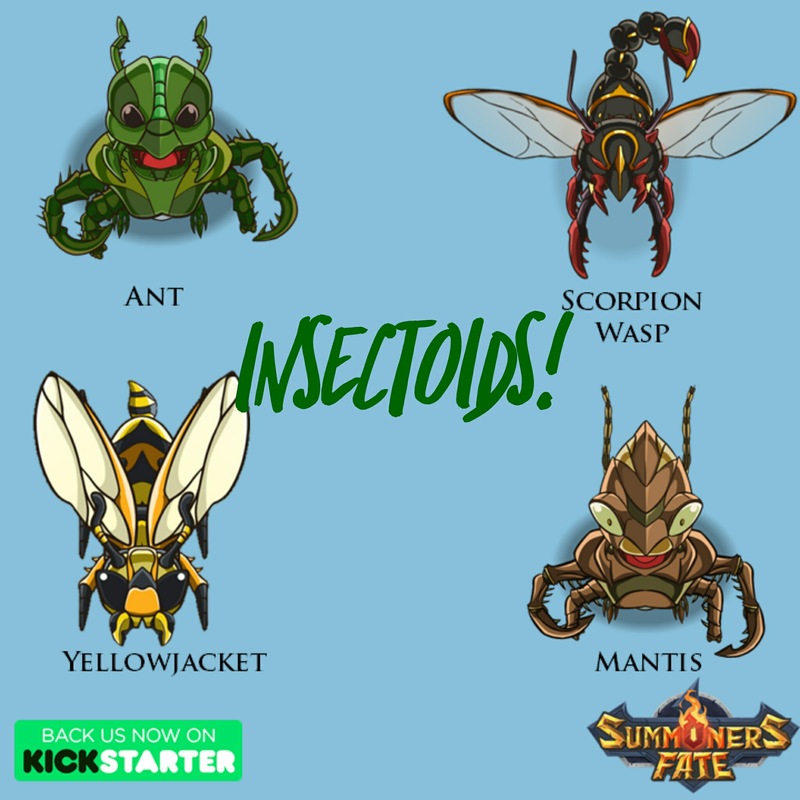 We will go more in depth with the Insectoids tomorrow, including finished art and animations. Stay tuned! Well, this morning was a bit of a disappointment for Ross and me. We went to sleep last night being at 106% of our goal and getting our art prepared for our first Stretch Goal, the Celestial Steampunk Timekeeper Rats, and woke up to being below our goal at 92%. We were shocked and, honestly hurt, and upon doing further research, discovered a few large pledgers backed out without explanation. Sadly, it appears these "pledgers" were never true supporters and have done this same thing to other similar projects. We have contacted Kickstarter on the matter in hopes this won't happen to others like us. 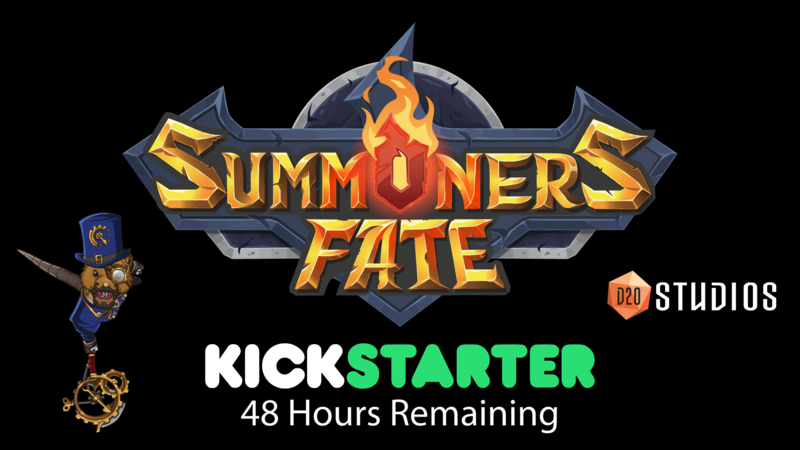 In the meantime, we decided we wanted to share this news with our supporters and fans of Summoners Fate so you can be part of our honest journey. We've been overjoyed by the encouraging messages we've received from you guys! Please know we read each of them, and they truly mean a lot to Ross and me. So - what now? Well, we are two pretty tenacious folks and we knew the startup life was not going to be an easy one. We are even more determined to make the Kickstarter a success with our 8 days left, and still have quite big plans for our game! Don't they look...cute and creepy?! LOL, that's a bit what we were going for. 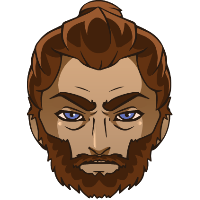 Fun Fact: Ross really likes insects, and knew he wanted to get them into our game as a playable race. He especially likes praying mantises and ants. However, Ross HATES yellowjackets in real life for all the times they've stung him while doing yardwork. He wanted to add them to the game as a way to defeat them on our battlefield! If you feel the same way, these may be the perfect opponent for you! What do you think? Would you like to play as the Insectoids? Or, would you like to squash these bugs in game?! Finally, any other insects we should include? Sound off here! Today's Daily Update will focus on 2 main topics: Angels and Reptis (Lizardmen). We think she is a great addition to the lineup, and fun to have another flying character. However, we are having trouble deciding on a weapon for her - sword? Mace? Enchanted harp?? Let us know in our Game Discussion post! > http://ow.ly/4h3330gtxxC. We can't wait to hear your ideas! 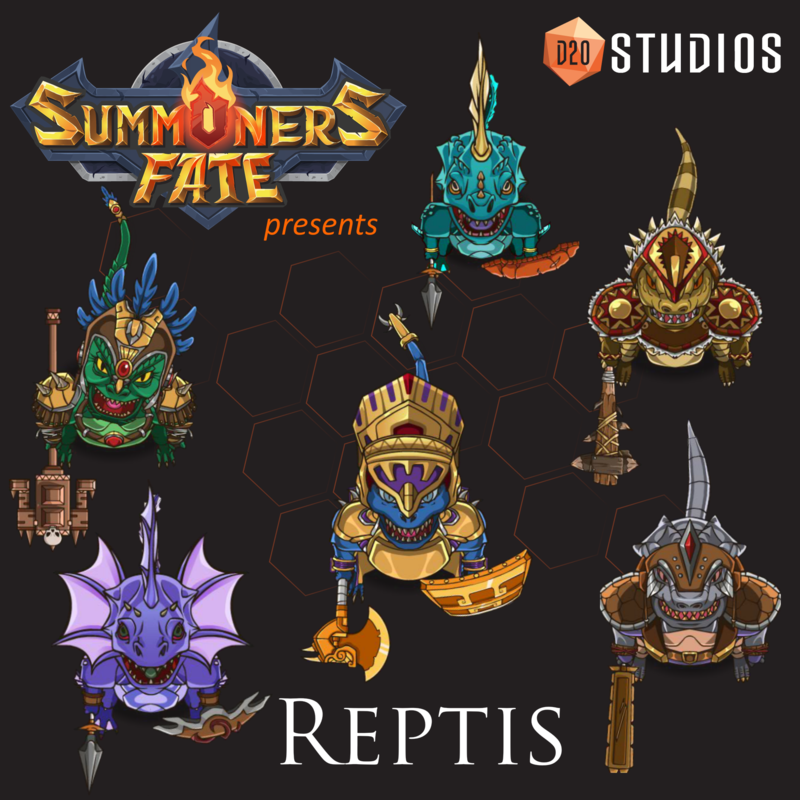 Next up, we've showcased our Reptis race (our name for what is traditionally called lizardmen) in some screenshots and avatars, but it's about time to "meet them," don't you think? From left to right: in green is our Reptis Shaman, below him in purple is our Reptis Frilled Champion, in gold armor is our Reptis Champion, above him in turquoise is our Reptis Frilled Scout, and the last two are Reptis Warriors. What do you think? 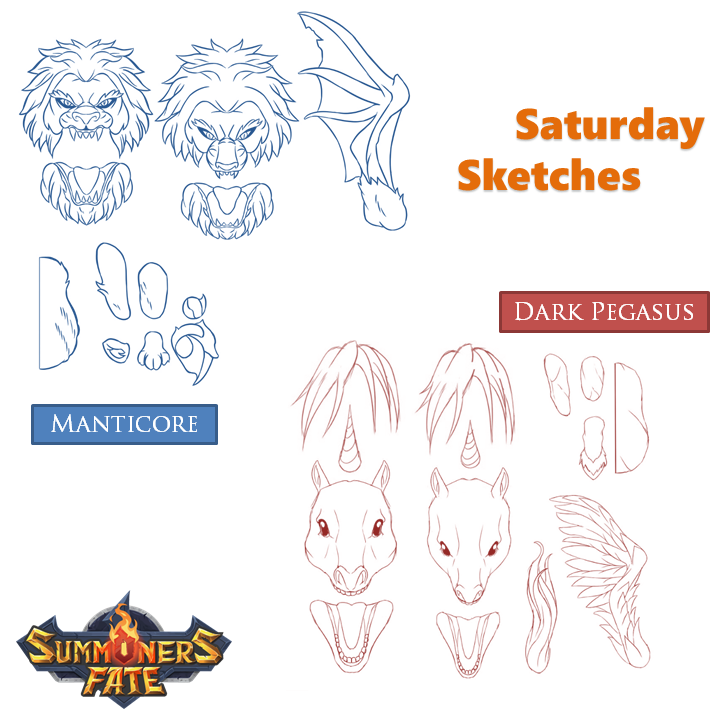 We think these cold-blooded creatures will add some fun, color, and unexpected strategic advantages for you on the Summoners Fate battlefield! Good evening! We are proud to share with you today some hands-on gameplay starring Ross on all of our target platforms. As you will see, our game supports portrait and landscape orientations, as well as adapts for left- and right-handedness with a simple turn of the device. Our vector graphics scale beautifully to large PC screens and high DPI retina screens. We've received feedback from some of our PC fans about the UI and we are planning to build a custom PC UI as well as support hotkeys and an alternative "zoomed out" interface with more detail/options panels for players that like to have this additional information handy. Finally - have you voted on the Angel's weapon yet? 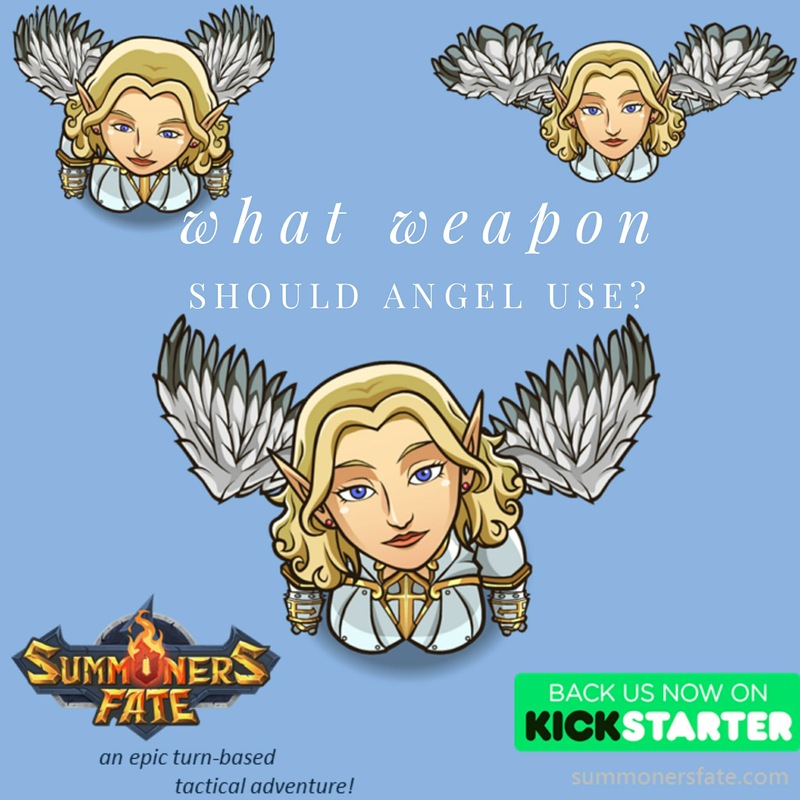 We received many amazing and creative options for the Angel's weapon - from swords to chakrams to piercing singing - and we need your help to decide. Click here to vote in the poll - make sure to scroll down on that page to see creative representations of the weapons to help you decide. We received some great feedback on our 1st hands-on gameplay video we posted yesterday (click here to see). Today, we have a shorter continuation of that video with the same Liche King battle, but this time on the PC. We have received requests for a larger map, and we will definitely create that video next. Stay tuned! This is coming to you quite late because we were hoping to get the finished large map play through to you today (thank you to Gundam0518 for suggesting it!). It is done, filmed, and looks great - but is taking longer than expected to upload to YouTube for us to share it with you. So, we will need to push back the reveal until tomorrow. Note: if you are a Subscriber to our YouTube channel, you will get the first look as it is set to go public when it finishes uploading, sometime tonight! To become a subscriber, click here. Here is a little GIF from the video showcasing the awesome spike-wall-damage idea suggested by Maltross: We did this in slow-mo to really let you savor that satisfying skeleton defeat! In other news, we have 2 polls going on - our Angel weapon vote (fire sword and intricate gold sword are tied!) 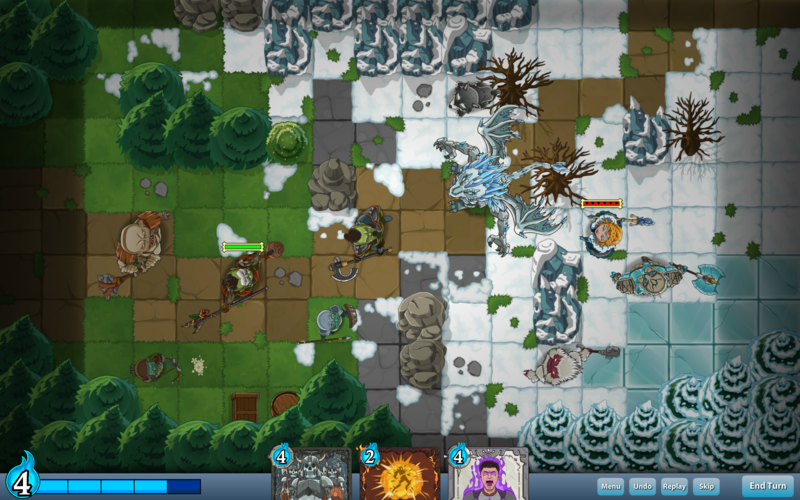 and our new Arcane vs. Nature card class vote. Click on the hyperlinks to cast your vote, and feel free to leave us a comment to explain your choices. For those of you who may have missed it, we got Ross and my livestream Q&A video up on our YouTube channel today. In this video, we answered questions for viewers about the game and our development process, showed a bit about our original board game, and discuss our extensive Warhammer and Reaper miniature collections! Finally, we had a very encouraging day on our Kickstarter and Ross and I are just so grateful and excited. 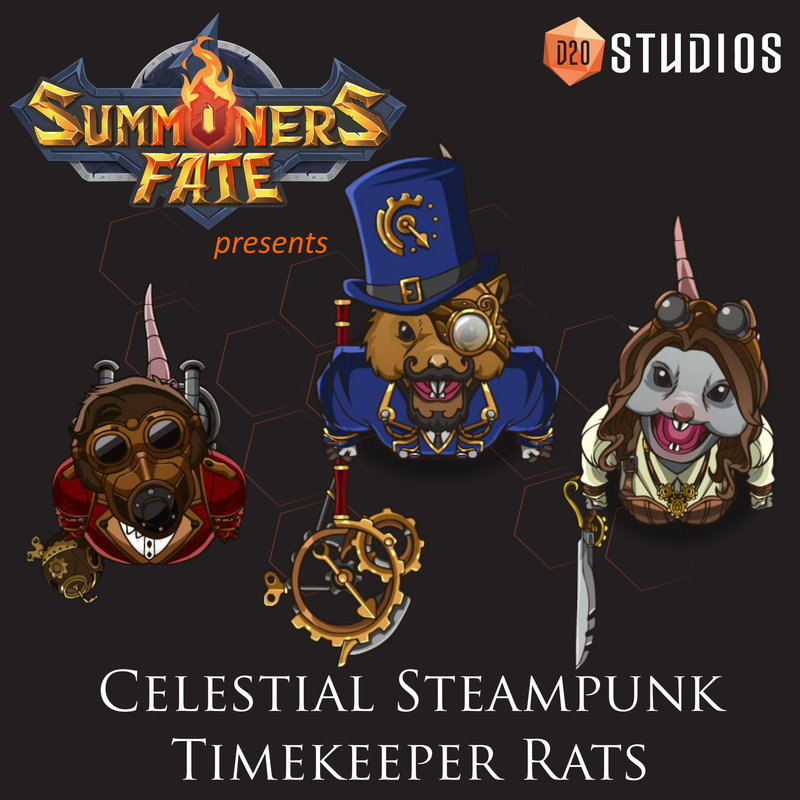 We now have 4 days left, and are really excited to reach that 1st stretch goal: Celestial Steampunk Timekeeper Rats. We will be showcasing some of their art here shortly as I know many of you have expressed interest in learning more about the rats and their time spells. To visit our Kickstarter page, click here. Many exciting developments, so let's get right to it! First, we hit another Social Goal on our Kickstarter campaign - woo-hoo! 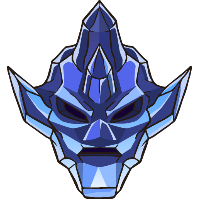 The reward for hitting this goal is that all players receive Reptis Race Discord Icons! Click here to start using them in our Discord today. 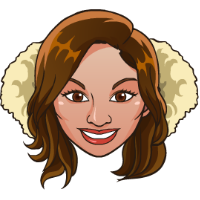 Speaking of Social Goals, over on our Game Discussion page, we have a poll going for what our next set of Discord Icons should be rewarded next. Click here to vote in that poll - Heroic Humans, Mythical Characters, or Elementals & Golems? What did you think? Leave a comment on YouTube, in our Discord, or here on the forum! Finally, with over three days still to go in our campaign, the Celestial Steampunk Timekeeper Rats goal is still in reach! Below are concept sketches for how we're envisioning the appearance of this race as well as some game mechanics we have planned that will allow you to manipulate time. 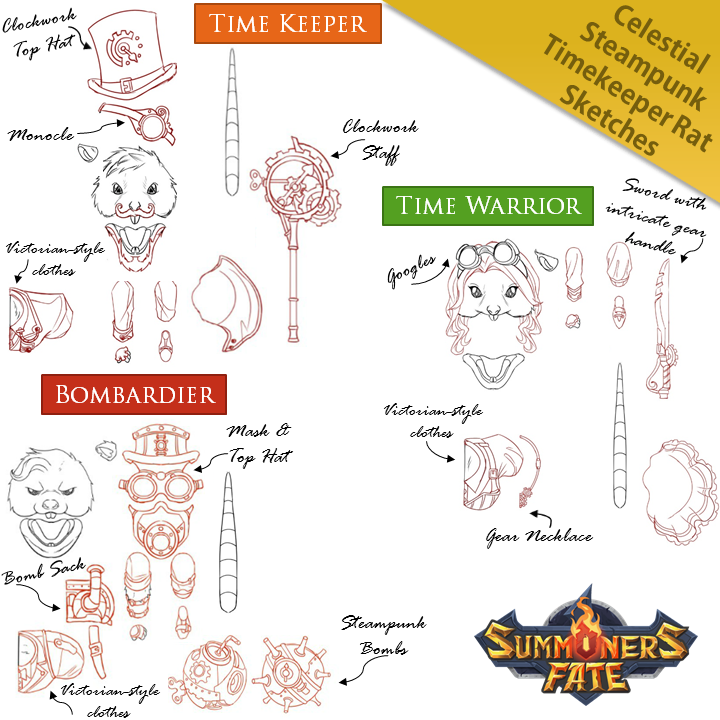 As you can see from the sketch above, the rats are inspired by Victorian-era clothing and have clockwork gear weapons and gadgetry. I really wanted these to be original characters, not typical dirty sewer rats, but rats with sophisticated tastes and culture. I also really wanted to find a way to bring in the fun Steampunk side to Summoners Fate and CLEARLY we think of rats when we think of this culture. I also wanted to go against the archetype that rat races in games means they are "bad" or "evil" characters; on the contrary, ours are Celestial and good characters that manipulate time and order. Turn Back Time: Rewind to the start of your last turn and remove this card from the game. Time Travel: Remove your Summoner from the board until the start of your next turn. These rats are looking awesome! It'll be a completely different game play. This brings a few ideas for additional cards. I'll be posting in the corresponding thread. We've been getting some really fun and inventive suggestions for characters and spells in our Share Your Ideas board. Check them out, let us know what you think of the suggestions coming in, and leave some of your own! I've increased the playable grid space to 9x14, further reduced the UI size, and balanced the left and right sides by unwrapping the multi function buttons to reveal their other states up front (ex: replay and skip). Circular style is replaced with rectangles to better fit the interface. The non-playable grid area is shadowed around the edges. This is just a layout mock to show scale and placement. Artistically, I'm thinking it might be cool to have the blue UI bar itself be made out of stone, perhaps vegetation wrapped or inset with gold trim. The mana bar would need the mana symbol itself incased in some sort of decorative texture (perhaps a circular extension of the stone/ruins itself) and something to make the bar look more like glass tube/alchemy. I still like the idea of symbolic buttons (vs. text) for the four secondary functions - better for localization and artistically more interesting. End turn button - up for debate - that could be text since it's the most important function. Behind the cards, it might be nice to have some kind of decorative radial arc extending above the bar. There's room to support more cards here as well (for abilities that allow you to draw beyond three) by arranging them in a fan. 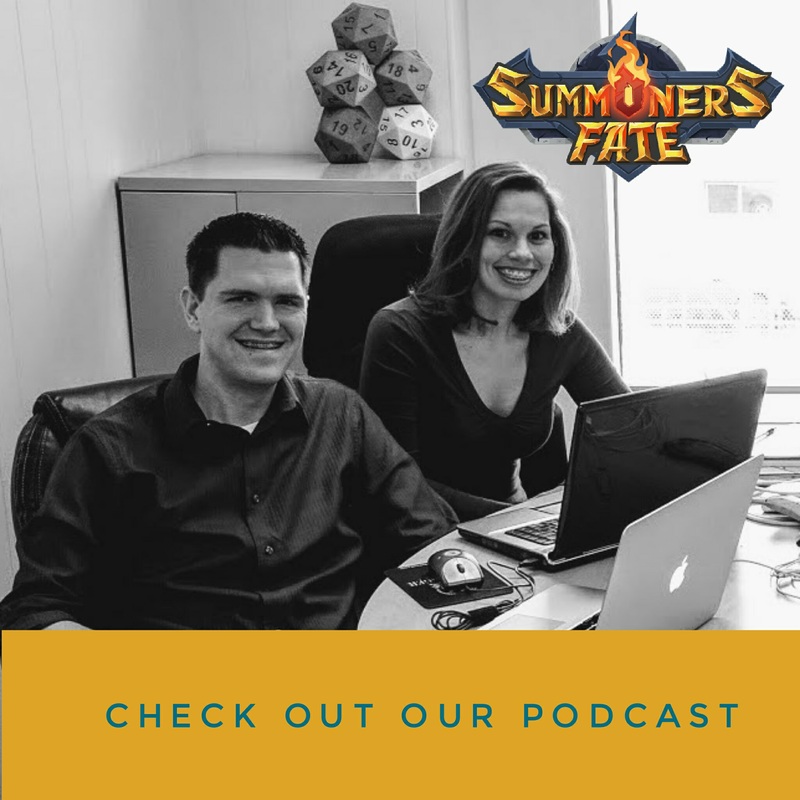 Finally, we wanted to draw attention again to our Gaming Podcast we did with the awesome guys over at The Chicago Gametrepreneur Show, where we discussed Summoners Fate, lessons learned, game mechanics, marketing, disco & more. In our Monday update, we shared some sketches of these wonderful creatures, and today I'm excited to share these beautiful full color renders that our art team graciously made a top priority. From left to right, we have the Time Bombardier, a ranged unit that can throw "time bombs" that damage and slow enemy movement, the Time Keeper, a powerful Summoner with the power to cast Celestial Time Spells, and the Time Warrior, a cunning melee fighter with hyper speed and lightning reflexes. Here is a selection of some of the Celestial Time spells we've created so far. 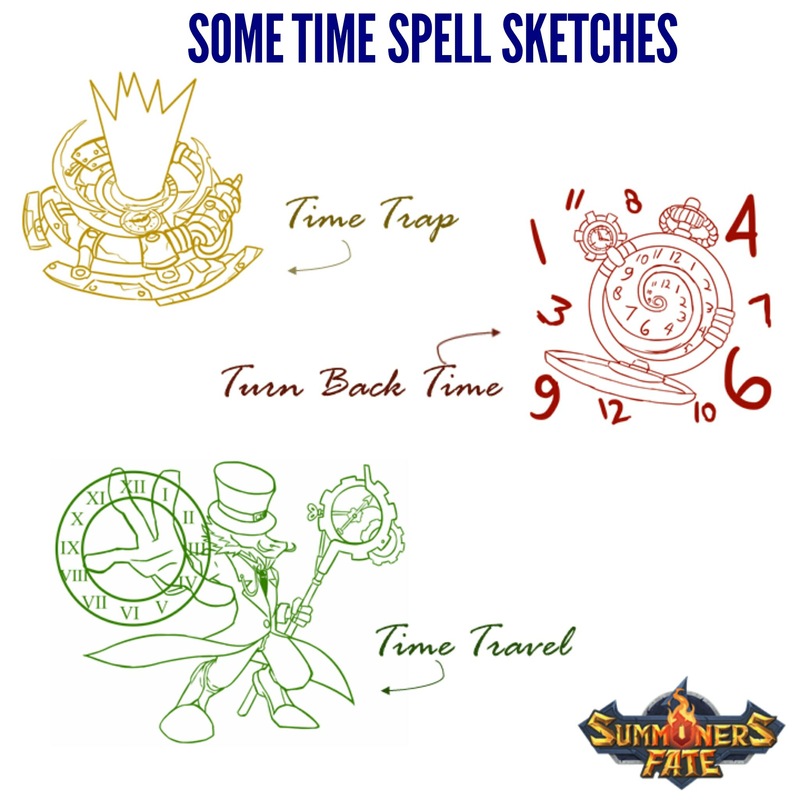 Time manipulation mechanics such as these are one of many unique innovations we aim to bring to the tactics and CCG genres. To learn more about Celestial Magic, the Steampunk Rats, and Time Spells, visit this forum post and join our discussion. There's still time left to support us and reach the Celestial Steampunk Timekeeper Rats Stretch goal! With less than 24 hours now left on the campaign, I'd like to share a recent interview I did with Seth Burn for the Anime Herald that expresses in thorough, honest detail why Kelly and I are making this game, why we chose to do this Kickstarter, and just how important you, our community, are to us. "Ross Przybylski is a man with a story in his heart, and a game to share with the world." "No one should ever wait to do what they want to do in their life because it could be over tomorrow. That was a gift [my dad] left me." "There are more powerful things to strive for in life than money. For us, building this game and the positive community around it, creating a haven for fans of these genres to reconnect and share fun experiences – in any small bit that this helps make the world a more enjoyable place to be – that is something we are both proud to spend our lives doing." Kelly and I have designed Summoners Fate as a community service that we aim to run for the next 10+ years. We are hoping this becomes akin to a hobby that you continue to enjoy well into the future, even as other games come and go. Because of this, I would like to call to your attention that our Kickstarter will be offering several exclusive reward opportunities that will not be available down the road. These rewards were carefully chosen as our way of saying "Thank you" to everyone who believed in us and pledged support during this Kickstarter. 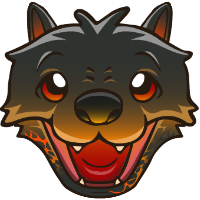 While the Hellhound Puppy will be an obtainable character in the game (albeit, very rare and hard to come by) the opportunity to give your puppy a customized name that will appear on his card is a Kickstarter-only exclusive. The Golden Dragon is a creature we created exclusively as a Kickstarter reward. This legendary character is a benevolent guardian dedicated to protecting mythic treasure, arcane spells, and other secrets. They are wise, ancient, and possess great mystical abilities. Kickstarter will be the only opportunity to obtain this exclusive card. Thanks for being a valued part of our community! 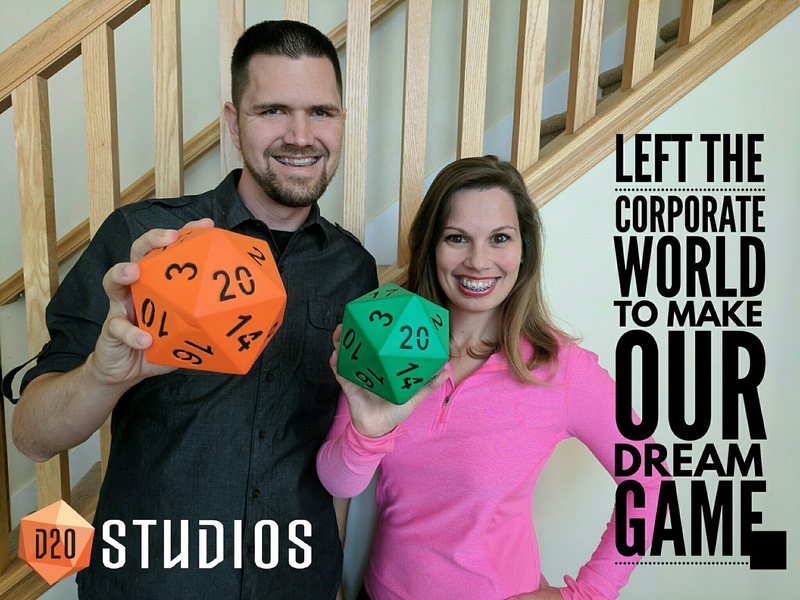 Whether or not you've decided to support our Kickstarter, Kelly and I grateful to have you a part of our player community and value each of you for being a fan and supporter of our team and the games we make. Thank you!